I don’t know about you, but I often find myself attending meetings that require me to reference a relevant document. Maybe we’re all working off one Google Doc, or perhaps we’re pouring over an intricate spreadsheet. Regardless, it’s best to make sure all meeting attendees have the materials they need before the meeting begins so they don’t have to go hunting in their inboxes for it. 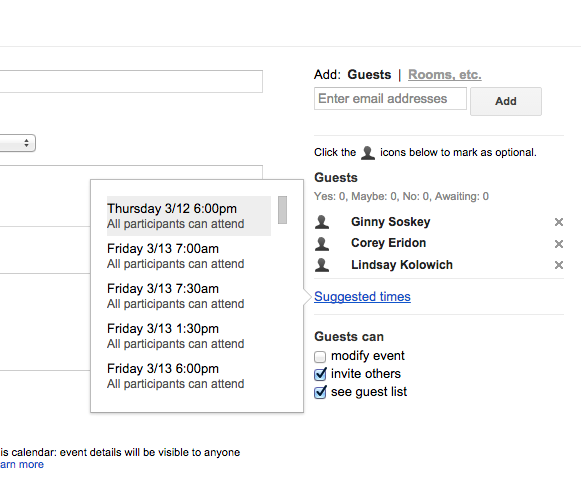 Google Calendar can help you do this, allowing you to attach documents directly to the event for guests to open and review. 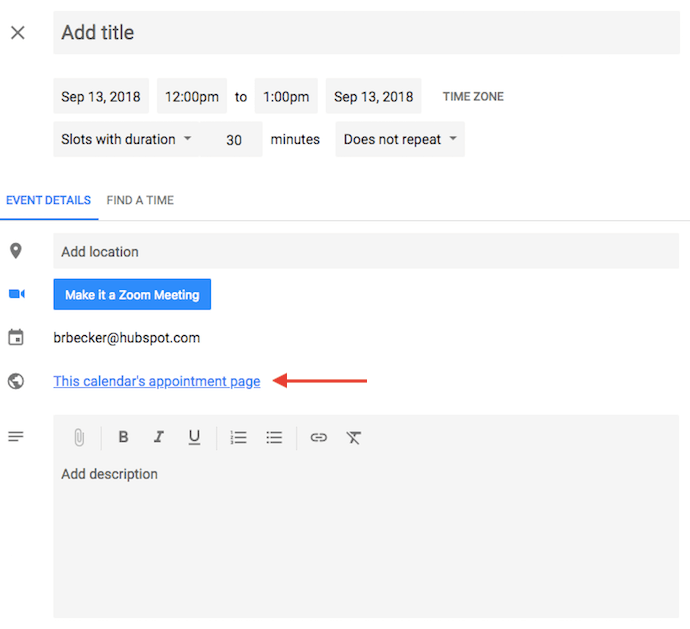 To attach a document to your event, click on your event block from the calendar view and select the pencil icon to edit the event, as shown below. Once you’re in the event’s edit screen, look for a paper clip icon right above the description section, as shown in the screenshot below. Click this icon and a large window will appear where you can upload files to attach directly from your Google Drive. Pro tip: When you reach the upload window, you can toggle to the “My Drive” tab to attach Google Docs, Sheets, and Slides that already exist in your Google Drive. Or, you can click the “Upload” tab on the far left of the window to attach offline files from your computer. 6. Enable your world clock. Do you work with teammates who live around the world? You might find it’s difficult to figure out what time is appropriate to schedule meetings with them. Fortunately, you can — by enabling “World Clock” in your Google Calendar settings. To quickly check multiple time zones when arranging meetings, click the gear icon on the top-righthand corner of your calendar view. These are your settings. Then, navigate to the “World clock” section, check the first blue box, and select the time zones you want to see from your calendar view. Not everyone is a 9-to-5 worker, but they might work quite a bit with those who are. If you have an unconventional work schedule that none of your colleagues seem to remember, this feature is for you. 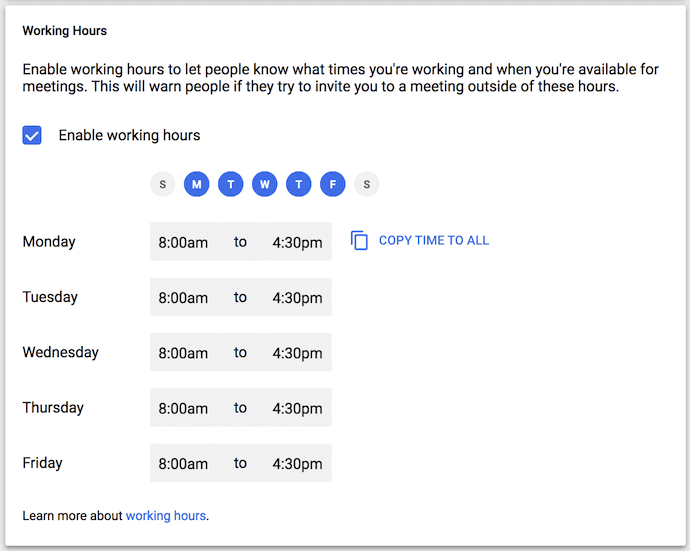 “Working Hours” is a setting that alerts people if they try to add you to a meeting that lies outside a range of hours set by you in Google Calendar. Hey, it beats having to hit “Decline” and then follow up with the meeting organizer to remind them you’re unavailable during that time. To enable specific working hours on your Google Calendar, click the gear icon from your calendar view to access your settings. Navigate to the “Working Hours” section, as shown below. Here, you’ll be able to specify when you’re in and out of work each day of the week. Remember the time you tried to email a large group of people about an event? Maybe you were trying to coordinate a team outing — or just let everyone know they should bring their laptops to the all-hands meeting. Regardless, I’ll bet it was annoying to figure out who was actually going to the event and ensure you didn’t forget anyone. Well, this Google Calendar feature will come in handy next time. As long as you’ve added everyone to the event that needs to go, you can easily email everyone in the group by clicking on the event block from your calendar view and clicking the envelope icon. Once you click on the envelope icon inside the event block, an email compose box will appear. Simply type in your message, type in the email addresses of the people you want to receive it, and hit send. 9. Add specific meeting locations. “Okay, so let’s meet at the one on State Street,” I said. “Oh, the one by the Court House?” he asked. “Well, it’s kinda by the Court House, but further down State Street,” I replied. “Oh, you mean the one by Downtown Crossing?” he clarified. The logistics of a meeting can get fuzzy without a specific address or conference room. Thankfully, Google Calendar has a feature that’ll fix all that. Instead of having the back-and-forth, I could’ve just sent my friend a calendar invitation with the specific address in the “Where” box. It integrates with Google Maps so it’s super easy to figure out where you’re meeting and how to get there. As you probably can tell by now, I love Google Calendar … but there is one feature of which I am not a fan. If you have your Google Calendar open as a tab in your browser when it’s 10 minutes before your next event, the 10-minute warning interrupts everything you’re doing and takes over your screen. Forget about what you were working on — Google Calendar will suddenly surface its tab with a big pop-up alert coupled with an annoying sound. It’s the worst. 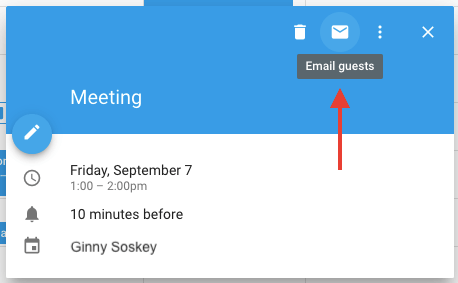 Luckily, there’s a setting in Google Calendar that you can use to make notifications much less annoying: “Desktop notifications.” Rather than interrupting your work, you’ll see a much gentler box slide in from the top-righthand corner of your computer screen, displaying the name of the event that’s 10 minutes away. 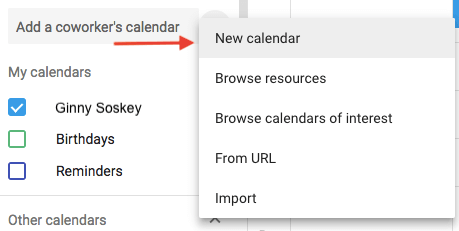 To enable “Desktop notifications” in Google Calendar, click into your settings using the gear icon on the top-righthand corner in your calendar view. Scroll down to “Event settings” and click the “Notifications” box, as shown below. By default, your notifications might be set as “Alerts,” causing each event’s 10-minute warning to hijack your computer screen. Instead, select “Desktop notifications,” return to your calendar view, and you will have successfully enabled gentler meeting notifications. 11. Change the event notification time. In the previous tip, you learned how to soften the notifications you receive in advance of a meeting. But did you also know you can change the number of minutes before the event you want to be notified? By default, Google will notify you 10 minutes before the event’s start time. To change this warning time for a particular event, click on the event from your calendar view, and select the pencil icon to edit the event’s settings. 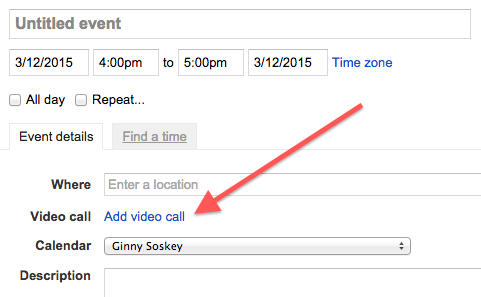 In the event details, find the bell icon just below the video conferencing line. Hover your cursor over the box listed “10” and toggle up and down using the small arrow keys that appear to the right to change the number of minutes in advance you want to be notified. As you can see below, you can tell Google to notify you hours, days, or weeks in advance, too. Pro tip: To the left of the “10,” you can change “Notification” to “Email” if you’d rather be told about upcoming meetings via email instead of a desktop notification. Ever thought about incorporating “office hours” so other folks in your company can book time with you? Maybe you’re a part-time consultant with limited hours to book meetings, or want to limit the times your team can book time with you to certain times of day. If any of the above scenarios resonate with you, think about using Google’s Appointment slots. 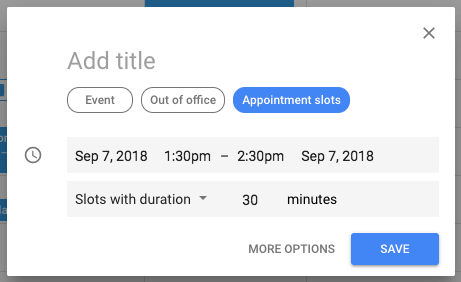 Google’s Appointment slots allow you carve out specific times of day on your calendar and then share these times with select people via a private calendar link. When these people click the link, they can schedule meetings with you at any of the times you carved out for them. 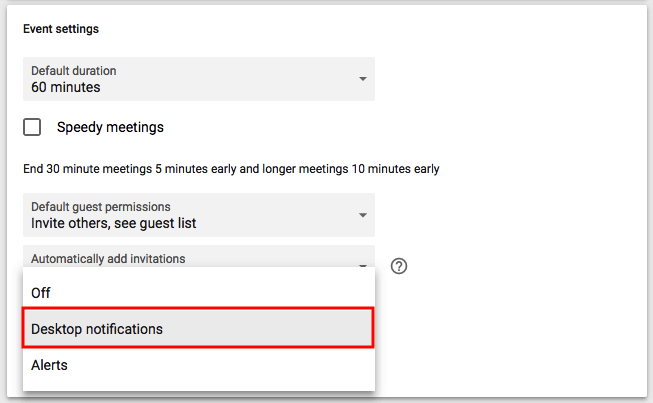 If your link recipients find a time they like, all they have to do is select it to book a private event with you, including all the information they’d need for the meeting. If you’d like more control over your Appointments, click “More Options,” and you’ll be taken to the window shown below. Click “This calendar’s appointment page” for the link you can then share with those whom you’re willing to arrange appointments. 13. Browse calendars of interest. Want to make sure you’re keeping track of holidays in other countries, your favorite sports team’s schedule, or just the time the sun rises and sets each day? You’ll find these calendars (and more) on your Google Calendar’s lefthand sidebar. To browse and add interesting calendars, click the plus sign (+) next to “Add a coworker’s calendar.” Then, choose “Browse calendars of interest.” From there, choose the calendars you’d like to subscribe to. 14. Implement a custom view. When you first set up your calendar, you’ll have the option to view it as a week, month, the next 4 days, or as an agenda. That “4 days” option? You can switch that out with a different interval in your “Custom view” options. 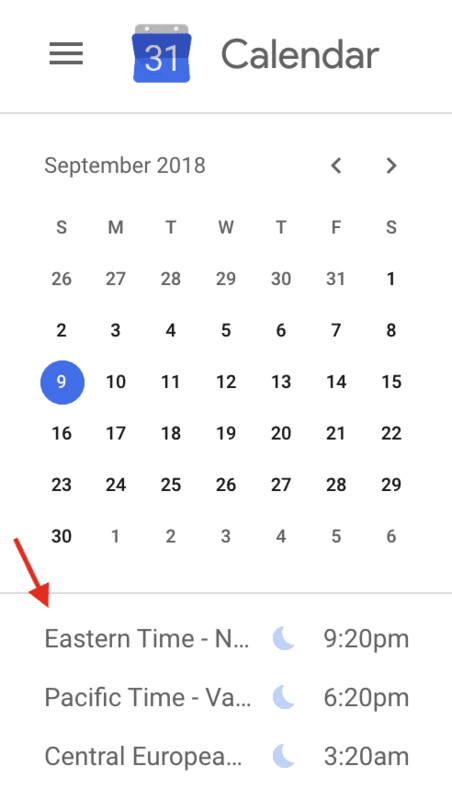 To adjust the number of days you see in your calendar view, click into your settings using the gear icon on the top-righthand corner of your screen. 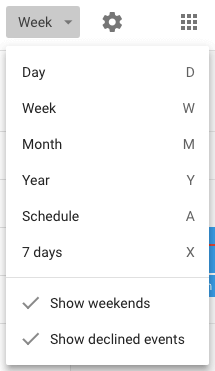 Scroll down to “View options.” Click “Set custom view” and select how many days you want to see at one time from your calendar view, as shown below. You can also make quicker, more general adjustments to your user interface right from your calendar view. Next to your settings’ gear icon, you’ll see a box that, by default, might say “Week.” Click it to reveal a dropdown menu where you can customize your view further, as shown below. 15. Share your calendars with others. 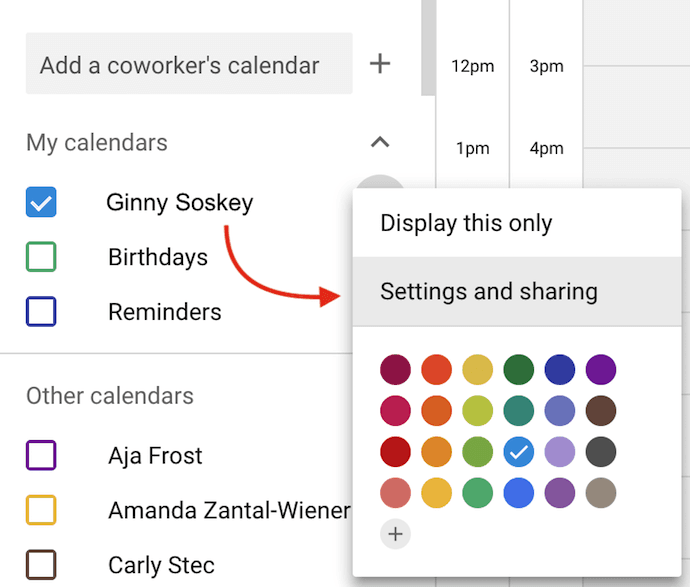 If you’re using Google Apps for your company, you can also control who sees your calendar, what they see, and whether they have permissions to edit it. (If you have an assistant, this tip will be very important to remember.) You can also make your calendar public, if you wish. To change your sharing settings, click on the plus sign (+) next to the preferred calendar and choose “Settings and sharing,” as shown below. Add someone to your calendar and choose their individual permissions (see all details, make changes to events, hide all details, etc). When you’re done, click the back arrow on the top-lefthand corner of your screen to return to your calendar view. 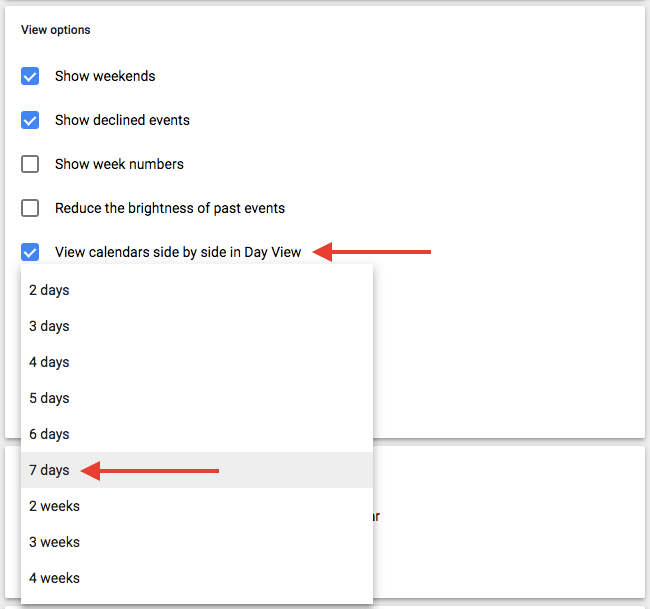 Google will automatically save your new calendar settings. 17. Sync meetings with your CRM. Use a CRM daily? 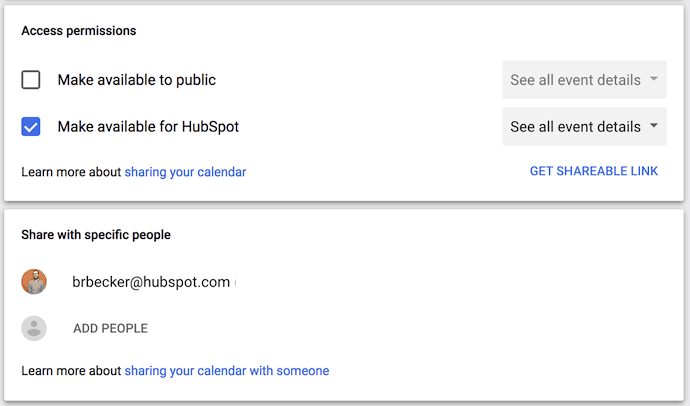 It can be annoying to back and forth between your Google Calendar and your CRM. 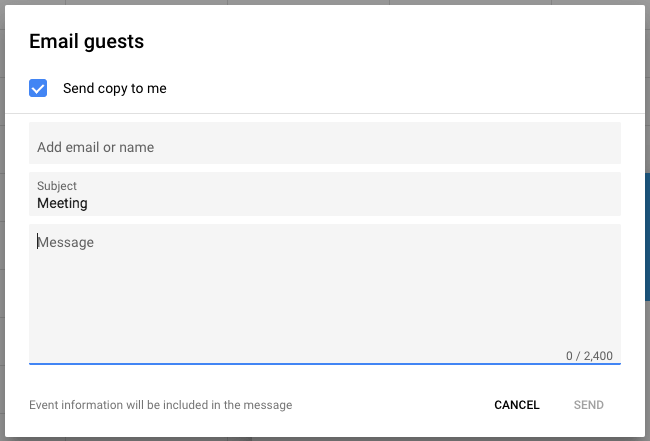 Instead, dive into your CRM settings to see if there’s an existing integration with Google Calendar. HubSpot CRM users, you’re in luck — it’s quick and easy to set up this integration. Learn more how here. 18. Sync your calendar with your marketing software.